Nothing compares than a good morning accompanied by a good cup of coffee after a good night’s sleep. But the combination of these 3 elements seems to be lacking for many people on a usual day of their lives. But not to worry, we might have at least one solution to this problem. Although I may not be able to help you get a good night sleep, I can help you improve your waking up ritual and morning. 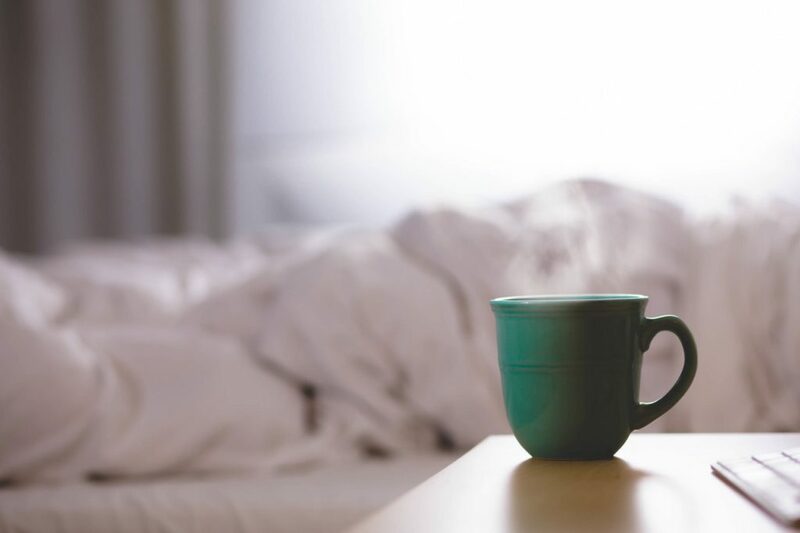 In today’s article I have selected a few products and product concepts that may help you at some point to turn your ordinary mornings into extraordinary ones. These alarm clocks have unique features that help you wake up in the most perfect way and add an element of their own. I’m sorry to say that some of these products are just at a concept level and you may not be able to buy them just yet but I wanted to share them with you because I appreciate the creativity and ingenuity that was clearly added to the thought process of the designers. And we start with a good one. This first alarm clock comes from clorofot and the design concept is introduced by Elodie Delassus, whose portfolio can be seen on the same website. The basic idea of this product is that we can wake up in a better way and mood by using all our senses. This machine not only makes your coffee first thing in the morning, at the time which you schedule it for, but also uses the sense of smell and taste to slowly but surely wake you up. This can be a great improvement from the basic methods that we use today, which involves mainly and in most cases only sound. 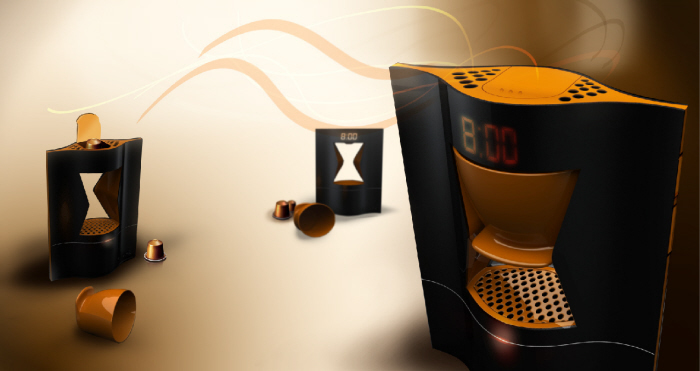 A project very similar to the first one presented, this alarm clock also calls out to your senses but this time it is more appropriate for the gourmands. If your idea of the perfect morning starts with a big breakfast rather than a good cup of coffee then this next product might be a better option for you. 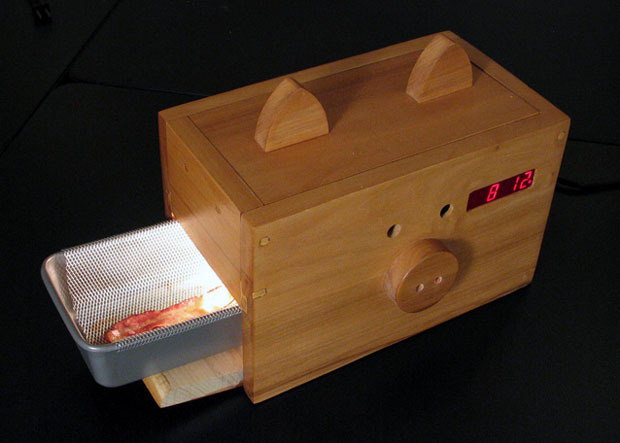 Although I would not necessarily recommend having the smell of bacon impregnated into your bedroom, I do like the idea of this clock and, of course, the shape of it. Just look at how cute that pig looks. 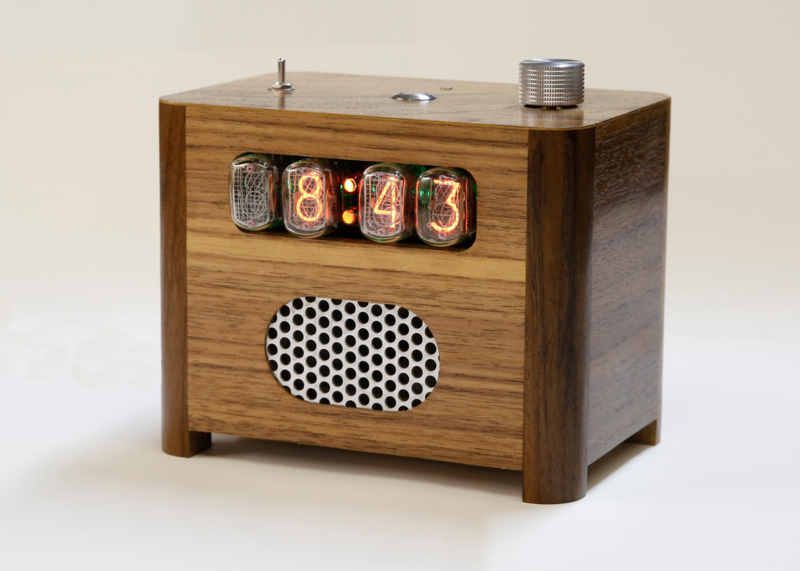 We move on to an entire different kind of alarm clock, one that will make you think twice about your day. 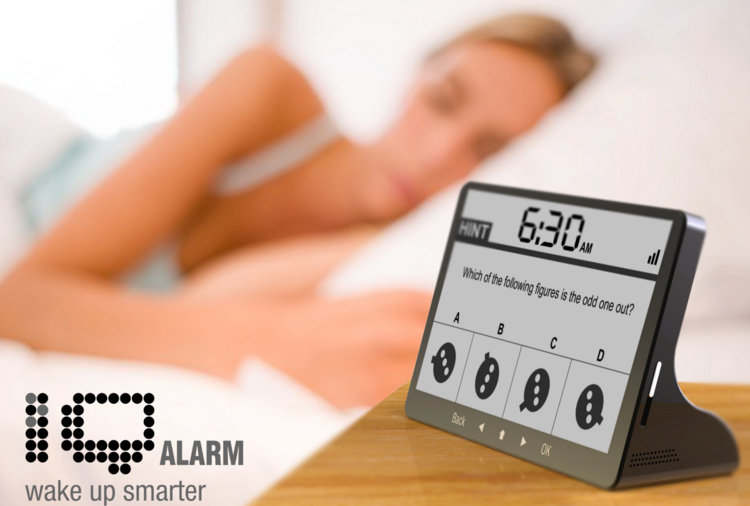 This alarm clock makes you think first thing in the morning by asking you a set of 1 to 3 questions, similar to those in IQ tests (from where we also have the name). In order to stop the alarm and start your proper day you will have to correctly answer these questions and this will get your mind working and make the sleepy state go away. If any of you out there are like me, then you are tired of loud noises or music waking you up in the morning. Since I use my phone as an alarm, I always set it to vibrate and for the sound I select a soft song with an increasing volume. This helps me wake up in a calmer way and have a good morning and a great day. So this is what I most appreciate at this next alarm clock. 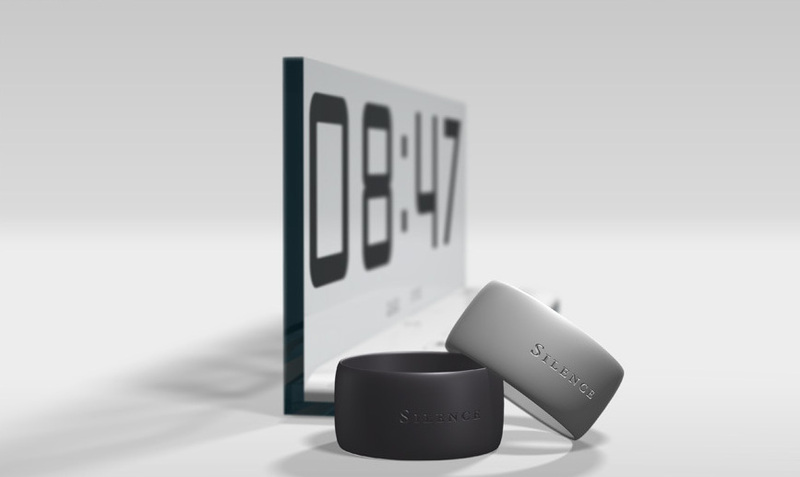 Known as the silent alarm clock, this device will wake you up with the help of a vibrating ring which you have to wear at night on your finger. This is also a great solution for when you have to wake up early and you don’t want to disturb your significant other or roommates. Wake up and reach for the skies first thing in the morning! With this alarm clock you can do that and have a better start to your day. This clock does not only help you get up in the morning but it also starts you off with a good night sleep by gradually dimming the light and fading out the music so that you can gently fall asleep. In the morning you have to reach for the sphere and lightly tap it in order to activate the snooze. 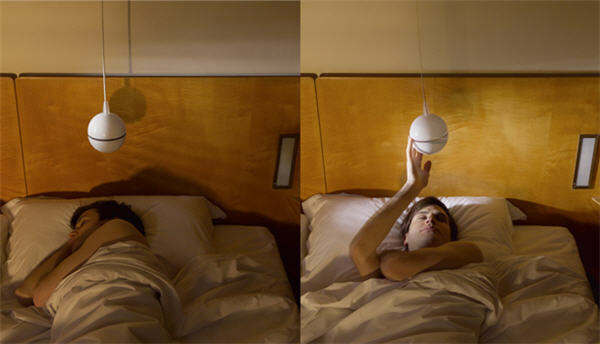 When activated, the snooze will make the sphere lift up and up until you are obliged to get out of bed in order to reach it, pull it down and finally shut it down. 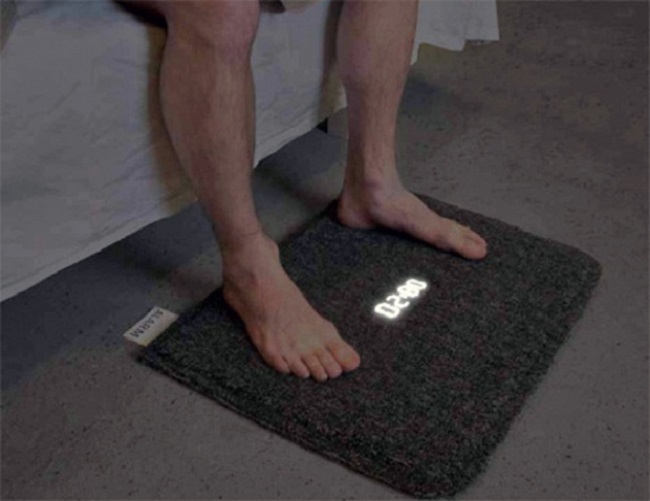 Another great idea of getting you out of bed in time and up on your feet is this next product. Unfortunately, still at a concept level of production, this wonderful mat is the perfect idea that will definitively make you get your feet on the floor and start your day on the right foot. No more snoozing back to sleep, just get up and be done with it! This last clock that I have to tell you about in today’s article is the best looking one. I like it first of all for its stylish and interesting design which you can also see in the picture below. The ingenious concept of this alarm clock is that in order to shut it off, you have to walk up to the numeric touch pad, which you can set up in the kitchen or bathroom and insert today’s date. This will test your memory first thing in the morning, will make sure that you are woken up and will turn you into an organized person. By knowing which day it is first thing in the morning you will make sure to check the tasks for the day and get to work right away. Today’s featured photo comes from Unsplash. .